Born in East Los Angeles and a 1950 graduate of Wilson High School, Myron Berliner was a 5’9”/173 lb. defensive end on the 1951-1952 UCLA football teams, and played both defensive and offensive end in 1953. Berliner was honorable mention All-Pacific Coast his sophomore year. As a junior in 1952, he was named to the NBC All-America Team and the UPI All-Pacific Team. Although they were seldom published, Myron was cited on several "All-Opponent" teams, including USC's Trojans–all three varsity seasons, Cal's 1953 team, and the 1953 Wisconsin Badgers. In 1953, the NCAA instituted the "one platoon system", resulting in limited substitutions and players playing both offense and defense. Workhorse Berliner played 346 minutes in just nine games that season, the second highest on the Bruins team. 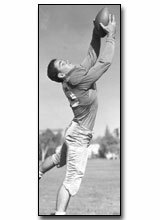 Though his strong suit was defense, he nonetheless was named to the '53 Coaches’ All-Pacific Coast second team. Coached by legendary Henry "Red" Sanders, Berliner’s Bruins produced a 20-3-1 three-year won-loss record. The 1953 team won the Pac 10 Championship and beat Wisconsin in the Rose Bowl. NOTE: In Myron Berliner’s first UCLA varsity season, he was not the lone Jewish player on the Bruins football roster. His ZBT fraternity brother Bob Zelinka started at weak-side guard, Herb Lane at weak-side end, Julie Weisstein at blocking back. Jewish Bruin subs included defensive ends Alan Raffee and Dan Laidman, center Ira Pauly (an SCJSHOF honoree), and Marv Spitz at defensive back. Spitz, Pauly, Raffee and Weisstein were all graduates of Beverly Hills High.